Hello, my name is Sarah Jayne and I am a hummus addict! Seriously, I can’t get enough of the stuff. If I had the choice between really good hummus and chocolate, I wouldn’t have to think twice about snatching the hummus out of the hands of the person asking such an odd question. However, until recently, I have usually been guilty of buying hummus from the store rather than trying my hand at making my own hummus recipe. Just like with the pesto the other week, I just always thought it would be too complicated for me to learn how to make hummus. Once again, I was wrong. I stumbled onto an easy hummus recipe that I really love because the base recipe doesn’t even use olive oil. Which means that I don’t feel at all bad about using tahini on my diet. It is such an easy hummus recipe that ever since my discovery of it, I have been playing around adding all sorts of things to it to come up with new hummus recipes. Lately, I have also been “suffering” from a bit if an olive addiction. The little green and black gems have been finding their way into just about every meal I put together. So, when it was time to put together my latest hummus recipe I couldn’t resist the temptation to throw in some olives and see what happened. I also had a bunch of fresh coriander – cilantro for our American friends – that needed to be used. So, I threw that in too. Boy did this turn out to be a seriously yummy hummus recipe! So, good that I simply topped it with a couple more olives (told you I am addictive) and ate it with warm pitas and made that my entire lunch! 1. 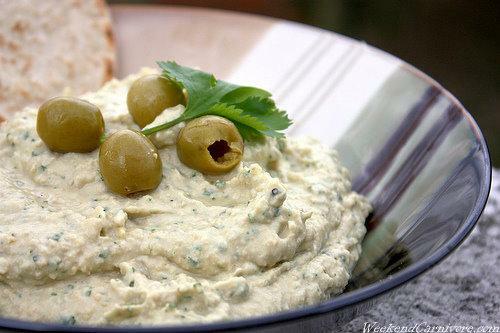 Put the chickpeas, tahini, lemon juice, garlic, coriander and olives into a blender or food processor. I use my mini chopper to make it extra easy. 2. 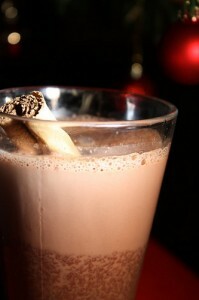 Blitz in short bursts, pushing the mixture down when needed until everything is combined. 3. Add a little bit of the reserved bean liquid and blitz again. Add more if you need more to get to the hummus texture you desire. 4. Serve in a bowl topped with olives. Every month, I take part on a vegetarian recipe swap over at Recipezaar. The basic idea is that everybody interested in the vegetarian recipe swap puts their name in and at the start of the month you adopt one of those chefs and somebody in turn adopts you. Over the following month you agree to make two vegetarian recipes from that person’s Recipezaar recipe collection. I love this because it is a great way to discover new vegetarian food and you don’t at all have to be a vegetarian to take part. In fact, I think that most people that are involved aren’t actually vegetarians but are just enjoying learning how to cook vegetarian dishes. That can never be a bad thing. This month, I adopted January Bride. I must have been in a lemon mood because the two recipes I decided to make both had some lemon element to them. The first was the lemon garlic green beans that I blogged about earlier in the month. The second were these amazing Lemon Pepper Nuts . If I am honest, when I selected this recipe I wasn’t sure if it would work. 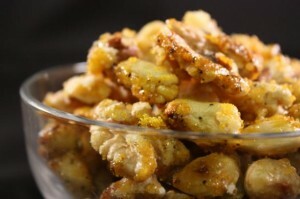 I love candied nuts and have had salt and pepper cashews before which I enjoyed. However, lemon pepper on nuts was something totally new. I am so glad that I tried them though because they were super easy to make – simply put the nuts, sugar and lemon pepper into a pan and heat and then cool down. On top of that, they were just incredibly tasty! There was a background of sweet heat that was perfectly balanced. I am glad I only made the one batch or I would have for sure eaten the whole nut recipe! It is even a vegan recipe so it doesn’t get much better when it comes to snack food recipes.